Sea Turtles Have Color Vision! 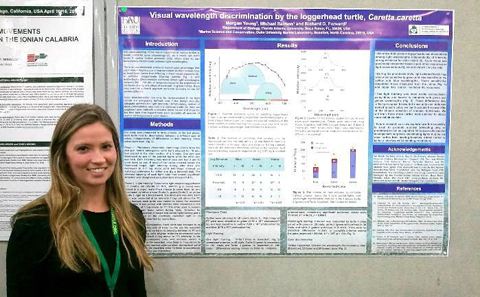 Morgan Young, a Masters degree student in Biology at Florida Atlantic University (Figure 1), won an Archie Carr Best Student Poster Award at the Annual Symposium on Sea Turtle Biology and Conservation, held this April in San Diego, California. Her research on marine turtle color vision was supported by The National Save the Sea Turtle Foundation. Her co-authors were Prof. Richard Forward (Duke University), and expert on vision and biological rhythms in marine animals, and her behavioral biologist advisor at FAU Prof. Mike Salmon. We know that marine turtles have good eyesight and use it to hunt for food and to detect and avoid their predators. That leads to an obvious question; Do marine turtles see and use colors to identify objects, or is their visual world one of different shades of grey, like a black and white movie? And, how do you get the turtles to answer these questions? Morgan used a two-stage process to obtain the answers. The first state, done with hatchlings, took advantage of an innate response used by the turtles to locate the sea from the nest; they crawl toward a brighter area using a response known as a phototaxis. Morgan used hundreds of hatchlings to determine the dimmest blue, green and yellow lights that attracted the hatchlings to each color. That enabled her to determine with certainty that the turtles could see each light, but not whether they saw each light as a color or as a shade of grey. The second state required training older turtles to swim toward one of a pair of colored lights, both brighter that the ones used to induce a hatchling phototaxis. (Figure 2). To complete this phase, she had to train the turtles to associate one color with food reward (a piece of raw shrimp) and ignore the other (unrewarded) color. Over several weeks, she managed to train one turtle to distinguish between a blue and green, a second between a green and yellow, and a third turtle between a yellow and blue light. But that result still left unresolved how the turtles made the discrimination. Was it by seeing a spectrum of different colors or by seeing a spectrum of brightness on a white through grey to black scale? In the final set of experiments, Morgan ran many trials with each trained turtle while varying the brightness of the pairs of colored lights relative to one another during each trial. If the turtles always swam toward the brighter (or dimmer) light, regardless of its color, then the turtles were color-blind. However, if the turtles always swam toward the same colored light, regardless of its brightness, then the turtles had color vision. All three turtles consistently chose the right color no matter what its brightness, a convincing demonstration of color vision! Well done, Morgan! Figure 1. Morgan Young at her post while it was on display at the Symposium. Students were quizzed by several judges who determined which projects should receive awards. Figure 2. 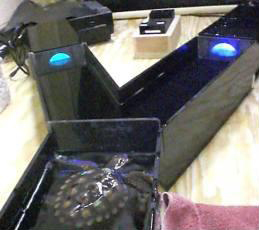 Apparatus used to train older turtles to make light discriminations, in this instance between a green light (left) and a blue light (right). During training, the turtle is first confined to the start area, as shown here. When the clear barrier between the start area and arms is raised, the turtle swims down one or the other arm but receives a shrimp reward only if it selects (in this case) the arm with the blue light. Once trained, it will swim toward the blue light, regardless of where it is located (left or right arm) or its brightness relative to the green light. This turtle is already trained to blue as it is trying to swim toward that arm, even before the clear barrier is raised.